Harold Holzer’s passion for Lincolniana started early. When the historian was “barely out of [his teens],” he purchased the first item in his collection—a small envelope “franked,” or signed instead of stamped, by then-Congressman Abraham Lincoln. By the age of 22, he had narrowed his acquisitional interests down to engravings and lithographs depicting the legendary U.S. president. Some 50 years later, Holzer’s collection boasts an impressive 740 artifacts, including an 1860 portrait of a beardless Lincoln, a 1907 bronze relief plaque that served as the basis of the likeness seen on pennies to this day and a plaster bust by the artist Sarah Fisher Ames. Given the sheer volume of his collection, it’s unsurprising that the assemblage took up a considerable amount of space in the Rye, New York, home Holzer shares with his wife Edith. 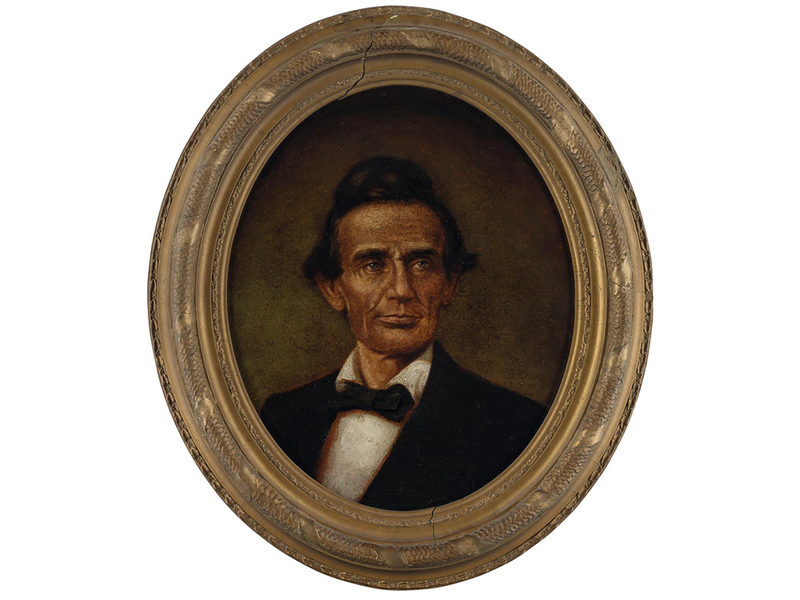 Now, as the couple finalizes plans to downsize to a Manhattan apartment, Holzer is preparing to part with his eclectic trove of Lincoln-related items. And, Julia Jacobs reports for the New York Times, the historian is planning on making a clean break by selling everything but a small selection of modern art. Swann sale specialist Rick Stattler tells Jacobs that Holzer’s collection offers modest financial value but remarkable historical and personal significance. A period portrait believed to be John C. Wolfe’s June 1860 painting of Lincoln is the most valuable item in the sale, with an estimate of between $12,000 and $18,000. The Fisher Ames plaster bust, which Holzer dates to just before the president delivered the Gettysburg Address, carries an estimate of between $6,000 and $9,000, as does a fourth-edition print released to show Lincoln’s likeness to crowds gathered at Chicago’s Wigwam convention hall for the announcement of the 1860 Republican presidential candidate. Overall, the sale is expected to bring in between $158,000 and $236,300. According to Jacobs, the Holzers have been spending their weekends scouring flea markets for Lincolniana since the early 1970s. The search for Lincoln treasures brought them all over the northeast, including places like Adamstown, Pennsylvania, where Holzer chanced upon a print featuring Lincoln ascending to heaven in the company of angels (the design wasn’t original, as earlier printmakers had sold nearly identical ones of George Washington). Holzer’s Lincoln fascination, of course, extends far beyond memorabilia: He has authored or edited 52 books on the president and has two more tomes forthcoming. In his introduction to the auction catalogue, Holzer explains that one of his earliest acquisitions, a lithograph of the Lincoln family crafted by Philadelphia artist Anton Hohenstein, sparked his interest in scholarly study of the president. Several weeks after making the initial purchase, Holzer chanced upon an image in Life Magazine depicting then-President Richard Nixon sitting in his White House study below what appeared to be the very lithograph he had just purchased. Despite dedicating the majority of his life to unraveling the public’s enduring fascination with Lincoln, and particularly representations of his physical appearance, Holzer notes that he can’t quite pinpoint his own lasting fascinating with Lincoln memorabilia. As the auction nears, though, he tells Jacob he’s yet to feel an “emotional reaction.” Perhaps this is because the historian is shifting his focus to another head of state: President Franklin Delano Roosevelt.